The Atlas Garage Pro 8000 EXT is a true 8,000 LB. four post lift. The Atlas Garage Pro 8000 EXT incorporates many of the great features of both the Atlas Garage Pro 8000 and the Atlas Garage Pro 9000. Many of our customers drive an SUV or pick up truck and wanted a storage lift that would “go higher” to allow them to park their taller vehicles under the elevated ramps. Many of our competitors sell “taller” lifts. However, their “taller” lifts also have longer runways. Our customers requested that we make a lift which lifts higher, but does not need to have longer ramps. (Longer ramps take up needed garage space). Most customers want to store a car on top and park a SUV or pick up truck below. There is no need for longer ramps. Our Atlas Garage Pro 8000 EXT ramps will accommodate a vehicle with a 156 inch wheel base. The Atlas Garage Pro 8000 EXT has been engineered to provide 79″ of clearance UNDER the bottom of the raised runway, but keep the runway length to just less than 14 feet long. If you need the extra lifting height of the Atlas Garage Pro 9000, but do not need the extra width and runway length provided by that lift, then the NEW Atlas Garage Pro 8000 EXT is the perfect choice. The Atlas Garage Pro 8000 EXT is capable of lifting your pick up truck or car 84 1/4 inches. 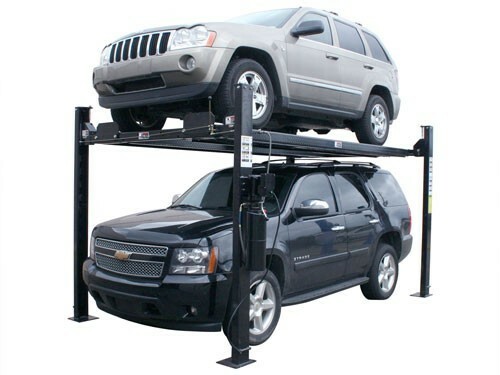 This above ground lift is the perfect choice for storing your vehicle. The extended height feature of the Atlas Garage Pro 8000 EXT Plus makes this lift the perfect choice for parking taller vehicles under stored vehicles. The Atlas Garage Pro 8000 EXT comes standard with a powerful 110 volt power unit. All Atlas four post lifts (8,000 lb. capacity) are designed and built for use by homeowners or restoration shop owners. If you have questions about which lift will best suit your application, please ask us. The Atlas Garage Pro 8000 EXT exclusive “Pulley Block System” uses a larger diameter cylinder and piston than the competition. The advantages of this system include reducing side loading pressure on the cylinder shaft bearings. The system provides 2″ of lift for every 1″ of piston stroke travel. The Atlas Garage Pro 8000 EXT has the same “lock ladder” column design system as the Garage Pro 8000, Garage Pro 9000, and Atlas 14K. The columns on our 7,000 LB. 8,000 LB. 9,000 LB. and 14,000 LB. four post lifts incorporate the “lock ladder” system which allows the customer to level the lift runways (both front to back and side to side), on floors that are not quite level. The “lock ladder” column system is the same column system found on professional grade lifts found in car dealerships and automotive service centers. This Atlas Garage Pro 8000 EXT locking system offers a unique two position locking mechanism found only in commercial grade cable style four post lifts. The DOUBLE LOCK SAFETY SYSTEM is found exclusively on the Atlas Garage Pro 8000 EXT, Atlas Garage Pro 8000, Atlas Garage Pro 9000, and the Atlas Pro 14K. The Atlas Garage Pro 8000 EXT incorporates the unique DOUBLE LOCK SAFETY SYSTEM into each of its four oversized columns. The DOUBLE LOCK SAFETY SYSTEM is designed to ensure that if a lifting cable becomes slack (for any reason), the secondary locking mechanism automatically engages. This DOUBLE LOCK SAFETY SYSTEM is found only on other four post above ground lifts costing hundreds of dollars more than the Atlas Garage Pro 8000 EXT. The Atlas Garage Pro 8000 EXT has manual single point release that allows the operator to release all the safety locks at one time. The Atlas Garage Pro 8000 EXT DOES NOT need to be anchored to the floor. However, if you are using a four post above ground lift many times each day, the lift may “scoot” a little on a smooth concrete floor. All four post lifts (Including the Direct Lift four post lifts and all other competitor’s four post lifts) will move slightly on a smooth concrete floor if there is a constant flow of vehicles on and off the lift. The stability and integrity of the lift will not be compromised by the slight “scooting” of the four post lift. To eliminate the possibility of any “scooting”, we recommend you anchor (with just one anchor) two of the column bases to your concrete floor. This anchoring will prevent the lift from “scooting”. Most of our above ground lift customers install their own car lifts. The average time to assemble the Atlas Garage Pro 8000 EXT car lift is four hours. 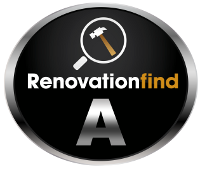 We provide detailed installation instructions with all our two post above ground lifts and our four post above ground lifts.